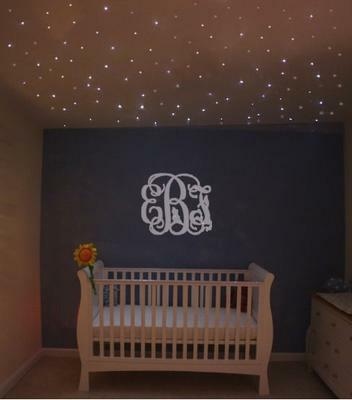 This baby girl's nursery bathed in star light has a very soft, romantic atmosphere. The light that softly filters down from the ceiling overhead closely resembles a night sky filled with twinkling stars. The unique nursery lighting system lends a softness and a sense of "other-worldliness" to the room. See more baby girl nursery pictures featuring soft lighting. This look would be virtually impossible to create using traditional bulbs commonly used in ceiling lights and lamps these are star nursery ceiling lights of a different kind. Parents who might wish (upon a star?) to increase the dramatic effect of a baby girl nursery bathed in star light can have the company design a custom light fixture that is a combination of cracked optical fiber and glass crystals together with dynamic color change capabilities. The complete length of the fiber in their custom pieces sparkles and then emits light at its end where the(approximately 16mm diameter) glass crystals are featured. The Fiber optics display creates an atmosphere in the space that once upon a time was only experienced by spending the night outdoors sleeping under the stars. As you can see from the design in the above pictures of the baby girl's nursery, this is a subtle, yet breathtakingly beautiful method of lighting a room created by a company appropriately named, Starscape, that creates focal points for the occasional baby moon and star nursery as well as large bespoke star ceilings, star domes and magnificent ceilings for home cinemas that are truly a sight to behold. Visitors of Unique Baby Gear Ideas that are looking for one-of-a-kind nursery ideas for their baby girl's room might focus on the ceiling before moving on to other decorative decisions. I love the peaceful atmosphere of this space. It is so pretty and at first I thought it would be too complicated for me to successfully manage a similar design but once I studied it carefully; it is actually very simple and I am considering trying to duplicate it. Join in and write your own page! It's easy to do. How? Simply click here to return to MOON and STARS THEME NURSERY PICTURES and DECORATING IDEAS.